I stumbled upon a fabulous little shop recently by the name of Amy Sue Crafts! It's a virtual treasure trove full of greeting cards, jewelry, magnets, bookmarks, tile coasters, t-shirts, hair accessories, etc. It's a shopping wonderland! What I love most about Amy Sue Crafts is that it has vintage-writing themed items. 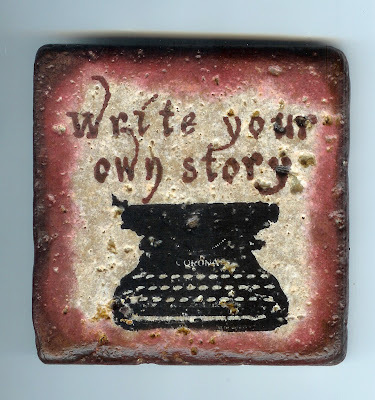 Amy is generously giving away the above marble tile coaster which reads "Write Your Own Story" - a fantastic desk piece for any coffee-addicted writer! It has an unusual reddish hue that makes it fantastically unique and feminine. For a chance to win, please visit Amy Sue Crafts and leave a comment below letting us know which other items you like. *Congratulations to our winner, Tracy! I like the sweet pea onesie, so cute! My favorite is the Bloody 3-D HALLOWEEN Marble Tile Decoration -- Blood, Bones, Spiders, Trick or Treat, Skull, Halloween Decor.That is one awesome coaster! Favorited Amy Sue Crafts on Etsy under Berendina Dykema. "Liked" Haute Whimsy on Facebook under Berendina Dykema. I like the Champagne, Silver, and Bronze Elegant Beaded Rosettes on Large Leaf! I also really like the Corona Typewriter candle! I like a lot the Batik Pattern Posy Fabric Flower Pin! Thanks for the awesome giveaway! I like the in everything give thanks magnet. I really like the bookmarks and the card sets. I love the Einstein quote magnet too! I love the "Vintage Fountain Pen Nib Round Copper Collage Pendant"
I love the Vintage ROYAL Typewriter Candle! I like the I give thanks Magnet. I follow Haute Whimsy on Google friend connect. I love the "2nd Typewriter Card Set"
Christina - xristya@rock.com - I like the White Fabric Flower and the Maroon Fabric Flower! Hearted on Etsy as vaverine. The Vintage Typewriter Ornament is beautiful! I love the matching Typewriter Domino Magnet -- Write Your Own Story! Thanks so much from karmakaytlyn@yahoo.com! I love the Beaded Chocolate Brown & Sheer Ivory Fabric Rosette! Follow via GFC! Kaelyn L.
I like the Origami Shirt Card and Matching Envelope -- Be Mine. My husband would roll his eyes if I gave it to him, but I don't really care. It's fabulous!